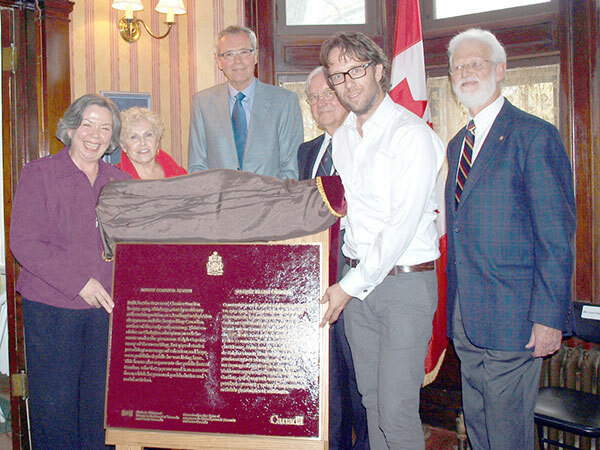 The plaque was unveiled at Ralph Connor House by (L-R): Joyce Bateman, Member of Parliament for Winnipeg South-Centre; Sylvia Marsh, President of the University Women’s Club of Winnipeg; Dr. John Lennox, University Professor Emeritus of English at York University; Robert Darling, Chair of the Friends of Ralph Connor House; John Gordon, great grandson of Charles W. Gordon; and Dr. Robert O’Kell, Manitoba representative of the Historic Sites and Monuments Board of Canada. Built by the Reverend Charles Gordon, this large, well-appointed house reflects his very public position as the best-selling Canadian author of the early 20th century, and his prominence as one of Canada’s best known writers at that time. Thirteen of the twenty-two Christian adventure novels Gordon wrote under the pen name of Ralph Connor, many of them exciting, fast-paced stories preaching a message of salvation and hope, were published while he was living in this house. The house represents the public face of the Reverend Gordon, a leading Presbyterian churchman who for twenty-three years used the house as a manse from which he undertook many important activities in the area of social activism. Minister, author, and social activist, Charles Gordon’s influence on Canadian society and literature was unparalleled in his time. Born in Glengarry County, Ontario in 1860, Gordon was the son of a Presbyterian minister; he studied at the University of Toronto, at Knox Theological College, and at the University of Edinburgh before his own ordination in 1890. Gordon’s brand of activism was rooted in the social gospel movement, which swept through Protestant churches in the late 19th and early 20th centuries. It promoted a Church that was involved in people’s social as well as their spiritual well-being. Gordon himself championed labour issues, immigration and settlement issues, and the temperance movement. Intimately linked with his deeply held social convictions were the themes of his many books and articles. Writing under the pen name Ralph Connor, Gordon’s literary career encompassed twenty-two novels, as well as numerous works of non-fiction. Gordon used writing as an extension of his ministry, and marshalled literature into the services of his energetic brand of Christianity. Characterized by themes of morality and justice, and written as gripping adventures set in Western Canada, Gordon’s books were immensely popular at home and abroad; indeed, over five million copies of his novels were sold, making him the most successful Canadian writer of the early 20th century. It was in this house that Gordon wrote many of his hugely popular and influential books, and it was here that he actively pursued his work as a minister and as an advocate of many social causes. The house at 54 West Gate was built in 1913–14 to the designs of one of Winnipeg’s most successful architects, George W. Northwood, in Armstrong’s Point on the Assiniboine River, an enclave of well-to-do houses developed in the late 19th and early 20th centuries. The house features details so beloved at the time, such as Tudor stacked chimneys and ornamental windows, executed in a rich red brick with contrasting warm, Manitoba Tyndall stone for trim, quoins, mullions and high foundations. The interior has a welcoming central hall, an ornamental stairway, and rich yet restrained woodwork. In October 2011, the former Winnipeg home of Rev. Charles W. Gordon (Ralph Connor) was designated a National Historic Site. 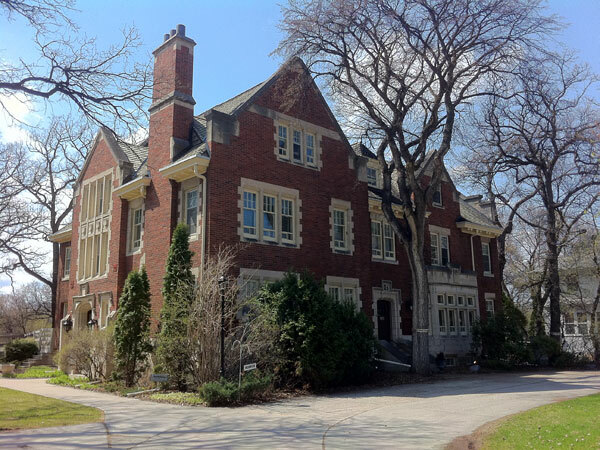 Built for the Reverend Charles Gordon in 1913–1914, this large, stately residence reflects his position as a leading Presbyterian clergyman and the best-selling Canadian author of the early 20th century. Thirteen of the 22 Christian adventure novels he wrote under the pen name Ralph Connor, many of them exciting, fast-paced stories preaching a message of salvation and hope, were published while he was living here. This house also represents the public face of Gordon, who for 23 years used it as a manse from which he pursued parish duties and social activism. Construite pour le révérend Charles Gordon en 1913-1914, cette prestigieuse demeure témoigne de la position sociale de cet éminent ecclésiastique presbytérien, le plus grand auteur à succès du Canada au début du XXe siècle. Lorsqu’il vivait ici, il publia 13 des 22 romans d’aventures d’inspiration chrétienne, écrits sous le pseudonyme de Ralph Connor. Plusieurs de ses récits, passionnants et très rythmés, livrent un message d’espoir et de salut. Cette résidence représente l’image publique de Gordon, qui s’en servit comme presbytère pendant 23 ans et y exerça d’importantes activités paroissiales et militantes.